Louisa Köber studied European Design in Stuttgart at Staatliche Akademie der Bildenden Künste, in Milan at the Politecnico di Milano and in Paris at Ensci – Les Ateliers. In 2014 she has won the Design A Bag Competition hosted by „Fashion Access“ in Hongkong with her weekender bag „Maki“. In the following year her shop installation „Sandscape“ for Rado won first price the Rado Star Price 2015. In 2017 oppa won with SPLIT table legs the iF-Award. 2017 to 2018 she added graphicdesign know-how to her palette by taking part by absolving the masterclass at die graphische in Vienna. 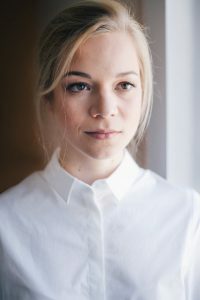 In 2019 together with Marie Rahm she co-founded the designstudio POLKA mint. Within her work there is a strong graphic influence: She works with colorful patterns and adds playful details to her products. Her products appear pure and have a smart twist on second sight in common.